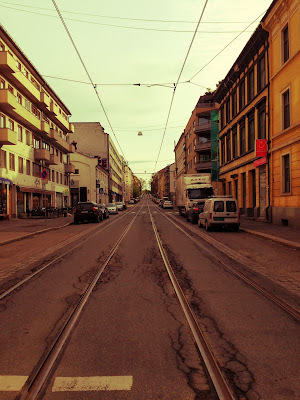 The tram stop for Håkon's old apartment was here. This was the street where I called Heidimarie and asked about the wonderful wine she and Erik served at their wedding. This was where Petter and I met each other before he went to New York. This is where I bought dinner today. This was the street I walked up to go to Heidi's birthday party on the 20th July 2011, after which I caught a cold and decided to stay home for the weekend. In Thereses gate I've walked home with Ole Thomas and Tamar after a night out. In Thereses gate, I met Patrick by coincidence earlier this fall, after several years. And in Thereses gate, Marta took this picture a morning when there, by some stroke of magic, was no one out, a morning earlier this summer.